Alternately explosive and restrained, the aptly titled The Bloom and the Blight is a meditation on past and present – melodic fury matched with the eloquent, confessional lyricism that has made Two Gallants an enduring favorite of both fans and critics. Capturing the sound of a new beginning, the duo’s Fargo Records debut The Bloom and the Blight celebrates the band’s much anticipated reunion following a multi-year break. It is the work of Two Gallants, fully matured, the band fearlessly exploring new ground in search of a sound that defines a very personal catharsis. That approach includes everything from the distorted ferocity of “Halcyon Days” to the heart-wrenching acoustic ballad, “Sunday Souvenirs”. Songs like “Ride Away” boast all the prowling, anthemic strut of classic metal; while tracks like “Winter’s Youth” start sweet and sad, than shatter into huge and heavy choruses. The album’s first single, “Broken Eyes,” has already become a crowd favorite with its raw, aching harmonies and weeping harmonica. Friends since they were five, the band grew up playing music together, from early teen-age house parties in their hometown of San Francisco, to multiple world tours. 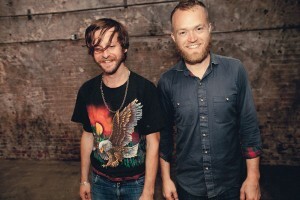 Throughout their extensive travels over the past 8 years – including recent tours through China and South Korea –, Two Gallants have continued to evolve, both musically and personally. The bands’ very first single, “Nothing to You” (from their 2004 debut The Throes), started off a string of cult classics that helped define their signature sound. The success of the sophomore album, What the Toll Tells (2006), delivered a few more singles, including “Steady Rollin’” and “Las Cruces Jail”. The wistful “Seems Like Home to Me” from The Scenery of Farewell EP (2007) and “Despite What You’ve Been Told” from 2007’s self-titled album, provide the framework of the bands development into The Bloom and the Blight. And everywhere on The Bloom and the Blight is an urgent, emotional poignancy, a visceral undercurrent that stems, in part, from Stephens’ experience recovering from his injuries after a serious van accident.